Sunday 6th January. 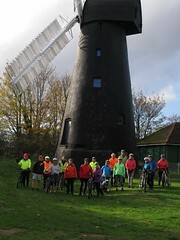 A largely overcast day, with a couple of brighter spells saw 19 Cyclists ready for the first ride of 2019, leave via Kingston Bridge, Bushy Park, Clapperstile gate, ( with 1 extra catching the tail at the 2nd attempt), Teddington, Teddington Footbridge, Thames Towpath, Petersham, Petersham gate, Richmond Park, Sheen gate, Palewell, Barnes, Towpath again, to Putney, – where the chosen lunch stop was already stuffed with Football supporters prior to the Fulham/ Oldham game-, with a small group electing to have lunch at a Cafe, the main party continued to Wandsworth, with option 2, not having food, -alas 1 person realising they had left a Pannier at the 1st stop-, option 3 ‘the Garrett Tavern’, more than satisfying our needs, with all the lost sheep back with the group, the Wandle trail, Earlsfield, more Wandle path, South Wimbledon, Merton park, Lower Morden to the Wyevale Garden centre for Tea & Bread Pudding, Morden Cemetery, Joseph Hood Park, Motspur park, New Malden, Berrylands, to Kingston. Total 27 Miles, 1 new face, thanks to Amy for back marking & others for corner marking, thanks to John for the BP. 20’s Plenty in Richmond – and Kingston too! As we reach the end of 2018, what has Kingston achieved on its Mini-Holland schemes this year? This new cycle and pedestrian link (which will be fully off-road for the part in Kingston borough) started construction in the Summer and good progress seems to have been made with the sub-base being prepared for the separate cycle and pedestrian paths. When complete it will be a completely new link from Raynes Park through to New Malden station and will connect with The Cut in New Malden taking you all the way from Raynes Park to Elm Road, New Malden. Work has been undertaken on different parts of Wheatfield Way this year with the junctions at Brook Street, Fairfield North and Clarence Street now all practically complete. We have been disappointed with the shared use designs at the junctions but have worked with the Council to get improvements made. For example, the Clarence Street junction now has a cycle ramp for cyclists to access the shared use island rather than using a dropped kerb that would often have been blocked by buses. Kingston High Street proved what can be done in a short period of time. Following the public consultation in Summer 2017, construction on Kingston High Street started in mid May 2018 with the main segregated track being completed in early July 2018. This is the quickest scheme that has gone from ‘consultation to finished’ so far in Kingston and, although it was a relatively short scheme, shows what can be done in a short period of time. The plaza works continued and have now finished with some small ‘snagging’ points to pick up. Although we would have preferred pedestrians and cyclists to have been segregated from each other, the plaza is now substantially larger than before the scheme was started with room taken from narrowing the carriageway. There is also now a wider cycle and pedestrian crossing from Kingston Station to Fife Road and the previously bumpy 2-way cycle track on Richmond Road underneath the railway bridge has been resurfaced too. A segregated 2 way track was built on Claremont Road between The Crescent and the Maple Road junction with the Maple Road junction also being upgraded to have all 4 arms of the junction operating as simultaneous shared pedestrian/cycle (‘toucan’) crossings. The remaining Surbiton links have also now been completed. In the future the Tolworth to Surbiton scheme will join the Surbiton ‘links’ at St Marks Hill and the Kingston to Surbiton scheme will join at Surbiton Crescent. In the future, we would like the Council to improve the link between the Crescent and St Marks Hill as currently this is an unfortunate gap in the Go Cycle schemes. Main construction works on the Kingston to Kingston Vale route started in October 2018 in the Kingston Vale area. The first stretch of one-way segregated track from Derwent Avenue towards the Kingston Vale University campus is now almost complete. A lot has been done in 2018 with a highlight being the short, but high quality, Kingston High Street scheme starting and completing in just two and a half months. Other works have been mainly focussed in Kingston town centre on ‘landmark’ schemes such as Kingston Station and Wheatfield Way. However, the Kingston Vale and New Malden to Raynes Park link schemes are looking very promising as they get into full swing. Early data from Portsmouth Road has shown that high quality, separated, infrastructure can lead to large increases in cycling in Kingston so we look forward to this spreading to other parts of the Borough as other high quality schemes complete. Our next update will share what we are expecting in 2019. In the meantime, let us know your thoughts! Wednesday 12th December. 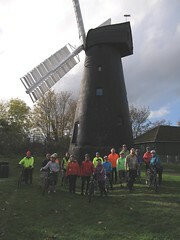 A cool day, with Sunny spells, saw 9 Cyclists, leave via the Portsmouth Rd track, Hinchley wood, Littleworth, Esher, Fairmile, Cobham, Downside, Bookham Common, Fetcham, Leatherhead, to Ashtead for lunch at the ‘Woodman’, Ashtead Park, Epsom, West Ewell, Chessington, to Long Ditton for Tea & Refreshments at Squires Garden centre, Surbiton, to Kingston, Total 28 Miles, thanks to Ellie for back marking duties. Work has started on the main Kingston Vale route. Kingston High Street – construction has now (subject to a couple of snagging points) been completed. This high quality scheme extends the very successful Portsmouth Road segregated 2-way cycle track onto Kingston High Street until just after its junction with Kingston Hall Road. As a next step, we would like motor traffic to be restricted on the North part of Kingston High Street (between Kingston Hall Road and the Market Place) to finish this link into Kingston town centre. We have also asked the Council to review loading bays and the times when loading is allowed before they are placed next to/on cycle tracks; we understand that this is now being looked at for future schemes and is also being monitored on completed schemes. Wheatfield Way – construction of the 3m wide 2-way cycle track between College Roundabout and the junction with Brook Street has been completed (signage/paint markings to be added). Work has recently been taking place at the Clarence Street/Old London Road junction (next to Wilko’s); Fairfield North junction (next to Fairfield Bus Station) and Brook Street junction. As per our last newsletter, we have been disappointed in some of the Wheatfield Way works and have been discussing with the Council the improvements that should be made. In good news, the Council has agreed to amend the shared island at the Clarence Street junction to allow easier and safer access by people on bikes. The Council is also looking at improvements to the Brook Street junction too. Unfortunately, despite these improvements, the scheme as a whole will still have a number of areas of shared use areas for pedestrians and people on bikes at junctions. We understand that this is due to TfL not allowing segregated space at junctions due to impacts shown in traffic modelling. We also await confirmation of when the consulted 20mph limit will be implemented on Wheatfield Way. Kingston Station – construction of the plaza directly outside of the station has almost finished. The Station works have also included re-laying the 2-way cycle track underneath the railway bridge on Richmond Road to provide a much smoother surface than before. Works on this scheme are now focussed on Wood Street to get ready for the replacement pedestrian and cyclist bridge to be installed over Kingsgate Road in Spring 2019. We have also heard that the ‘Beacon’ planned for the station plaza has been cancelled. We welcome this decision as the savings from this will be reinvested in other Mini-Holland schemes which offer greater benefits for people on bikes (and pedestrians) than the Beacon would have done. New Malden to Raynes Park – construction of this new route has now commenced. People on bikes and pedestrians will have their own separate paths from New Malden to Raynes Park Recreation Ground where the route will then connect into current cycle routes (which we hope will be improved by Merton Council in due course!). It is great to see construction start on this scheme and we are already looking forward to it being finished. Kingston Vale – construction on the main part of this route has also finally started! Kingston Vale is the longest individual scheme of all the Mini-Holland schemes and reaches from Kingston town centre all the way through to the Robin Hood junction on the A3. On its way it will connect numerous shops, schools, Kingston Hospital and Kingston University’s Kingston Hill campus. Work has started between Derwent Avenue and Warren Road and will include the installation of new zebra crossings (replacing informal ‘refuges’), new kerbs where these are needed and, for most of this section, the installation of Orcas (or an equivalent) to separate people on bikes from motor traffic. Orcas have been successfully used in many cycle schemes already in London and provide semi-segregation for cyclists from motor traffic. Although we would have preferred full segregation along the whole length of the route, the cost of this would have meant that other Mini-Holland schemes would not have been possible. To supplement the Orca installation, the Council will also be looking at putting in ‘wands’ and segregation islands where these are needed on the route. As above, there are a lot of schemes now in progress. Works will continue this year and into 2019 on the Kingston Station scheme; Wheatfield Way; New Malden to Raynes Park and Kingston Vale. 2019 should also see the start of works on Penrhyn Road, linking the Wheatfield Way scheme with Surbiton (passing the main Kingston University campus on its way). 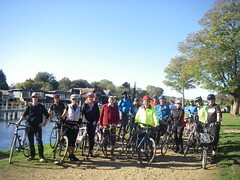 Kingston Cycling Campaign will continue to ask the Council for any improvements needed to schemes. If you have any comments on the Mini-Holland schemes proposed or currently in construction, please let us know. LCC is 40 and KCC is 32!